What is the Strassburg Sock? The Strassburg Sock is a device that the patient can wear while sleeping. It applies a gentle stretch on the plantar fascia, thus preventing it from tightening and shortening while the person is sleeping. The tightening and shortening of the fascia is what causes the intense pain in the morning when the person first begins walking. Patients will describe intense pain and limping that gradually “warms up” as the fascia loosens. To some this may seem a small inconvenience, but the constant irritation on a daily basis is partly what prevents the tissue from healing. Plantar fasciitis is a painful condition that affects both runners and non-runners alike. The pain is typically of gradual onset and becomes progressively worse. Patients will usually report pain that is worse after sleeping or sitting, and especially after running or other exercise. It is worthy to mention that many runners will say that it does not hurt while they are running. 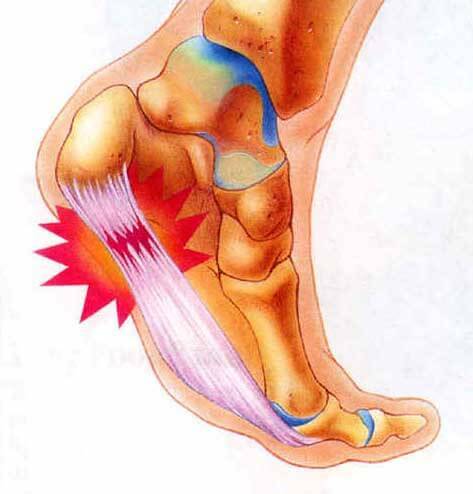 The pain is usually localized near the heel but can radiate into the arch as well. There are a few conditions that are similar to plantar fasciitis that are often confused with it, such as heel spurs or even calcaneal nerve entrapment. For those patients that are truly suffering from plantar fasciitis there are only a couple of proven and effective strategies. One of these “fixes” is the Strassburg Sock. The Strasburg Sock was a design modification due to the uncomfortable nature of a Night Boot/Splint that is often prescribed by doctors. The boot can be uncomfortable and bulky resulting in the patient not wanting to wear it. However, the Strassburg Sock also has a design flaw that some patients find uncomfortable. Years ago while listening to a patient complain about the discomfort associated with the Strassburg Sock I came up with a solution that has proven to not only make the sock more comfortable but seems to enhance its effectiveness. The design modification I am about to share is extremely simple and effective and most anyone should be able to modify it on their own. If you have a stiff, full length orthotic (3/4 orthotics will not work) simply insert it into the sock using a right orthotic for a right foot or a left orthotic for the left foot. Now put the sock on so that your foot is resting on the orthotic. Now as you adjust the tension on the sock you will notice that the tension is spread more evenly across the ball of your foot eliminating the annoying stretch on your first toe. If you do not have a full length orthotic you can remove the insert from your running shoe. Take a piece of cardboard and place your insert on top of it. Trace the insert and then cut the pattern with a scissor. Tape the cardboard to the bottom of your insert and place it into the Strassburg Sock. Another problem with the Strassburg Sock that patients have reported is they are unable to sleep through the night with it. As with anything it may take time to get use to it. If and when it wakes you simply remove it and try again the next night. You will gradually get used to the stretch being applied on your plantar fascia end eventually be able to sleep through the night. Be careful not to attempt to apply to much tension. What you are trying to accomplish is a light gentle stretch applied for a long duration of time. If the tension is too great it will definitely keep you from sleeping. If you work sitting down the Strasburg Sock can also be worn while working so it is not limited to wearing only while you sleep! Constant, mild tension applied to your plantar fascia by the Strassburg Sock will help keep it from shortening and may help in the prevention of disorganized and painful scar tissue from forming. Ultimately this will help in your fixing your plantar fasciitis by decreasing your pain. Stretching your plantar fascia using a Strassburg Sock may be only part of an effective strategy to eliminate your plantar fasciitis. There are other effective methods that we use in conjunction with the Sock. At San Diego Running Institute we use a combination of Ultrasound followed by ART/Myofascial Release and compression taping in addition to teaching our patients how to effectively use a Night Splint or Strassburg Sock depending on their preference. We also teach a very specific stretching protocol that the patient performs throughout the course of the day. In some instances we prescribe over the counter orthotics or custom orthotics depending on the circumstance to support your feet and arches while you are running, walking or doing some other form of sport or exercise.